I finally finished a workable German translation of the "Stele of Jeu" (PGM V, 96-172) for personal use based on the German 1928 Preisendanz translation (1) of the Greek Magical Papyri and his monograph Akephalos - The Headless God (2). The ritual requires a formula of "6 names" to be written on a parchment and read out aloud facing north. But it surprised me a bit to find no mention of the actual words in the text. There is no doubt that this has worked quite well for operating magi - from the Victorians (Goodwin, Mathers, Crowley) to today's Chaos Magicians (e.g. Gordon White). But in the original "Stele of Jeu" there is no mention that the above words are "the formula" to be used. Those six words are merely the only row of six subsequent powerful magical names to be found in the "Stele of Jeu" text. "The term ὄνομα apparently refers to a formula containing a number of magical words". A well known and very powerful spell! It does probably not hurt to use this one during the "Headless Rite" instead of the above discussed quite random pick of six magical names. Also check out the awesome paper The Ephesia Grammata: Logos Orphaikos or Apolline Alexima pharmaka? by Radcliffe G. Edmonds III. and this great post over at the Hekate Covenant on a different verison of the Ephesa Grammata that is being used in the PGM. "On the upper edge of the column is written the (damaged) name ...AIE AIÔI EYIAE AEI ÔÔE AIEOYEYÔ... [and that] the formula is 49 letters long and has a value of 9999 ... reference to a different spell about resurrection of a scarab that has the same name with 49 letters." αιη αιωι ηυιαη αη ιω ωη αιηουευω ... ιωη οαυ αεη υωυω. And this is what the revived words of the scarab call for. The spells concerning a scarab I could find in the same papyrus was PGM V 213-303 which is neither about a resurrection of the beetle, nor does it have any voces magicae in it. 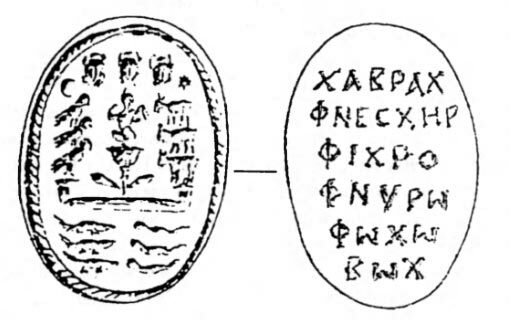 Another one about a scarab is PGM VII, 505-28 has the 48 letters long magical name "AÔ SATHREN ABRASAX IAÔAI AEÔ ÊÔA ÔAÊ IAO IÊO EY AÊ EY IE IAÔAI" in it, and it is also not about resurrecting the bug. The only spell about actually reviving a scarab in the PGM is number IV, 475-829 but it only contains very short barbarous names. PGM II. 64-183 has a little drawing of a scarab on the bottom of it. The ritual described is an "alternative procedure" on a conjuration of Apollon-Helios for wisdom and blessing. 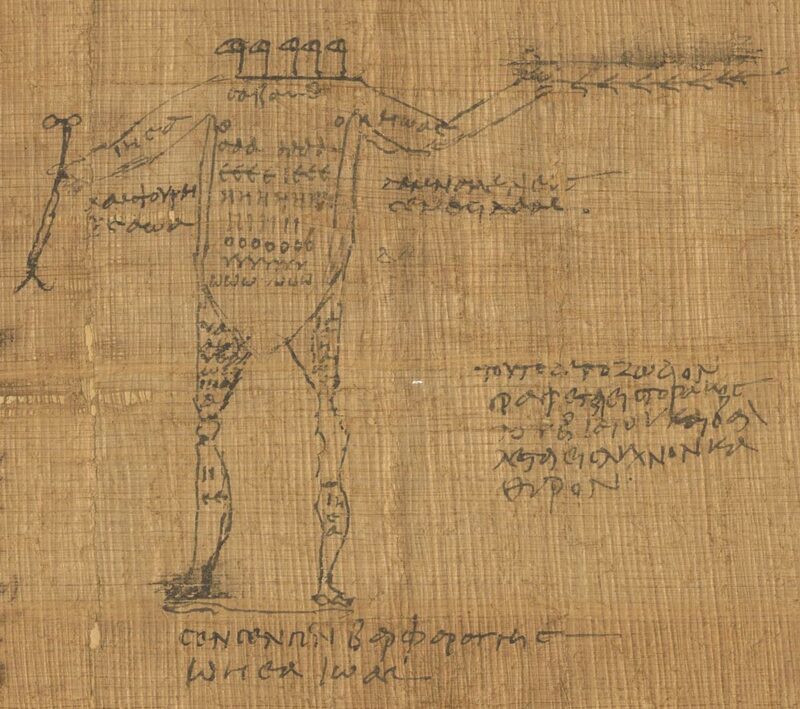 Especially when you look at the original papyrus (Berlin P. 5026) you will find it in the third column on the bottom - and guess what image is drawn right next to this column? A HEADLESS figure! The same one that Jake Stratton-Kent used on his little "Headless One" chapbook. Sounds familiar? Of course it does! Vowels! Is this the formula the author was referring to in the scribbled note regarding the scarab? Perhaps the annotation in the "Stele of Jeu" text was done hastily. The author might have remembered that the name to be used was "on that scarab whatever page," that it enumerates to 9,999 and consists of something along the line of "...AIE AIÔI EYIAE AEI ÔÔE AIEOYEYO...". OK, but it's longer than 49 letters, innit? Yes. But it is made up of the seven magical vowels, the source of everything, from the seven planets to the seven cardinal directions, and seven times seven equals 49. If you take a close look to the headless figure on the right side, he has each vowel written on his chest seven times. It's worth noting that the vowels are referred to as names ("shudderful names") in PGM V. 81, which directly precedes the Stele of Jeu in Betz. This is just a long shot, but maybe the scribe refers to them as "6" since - in PGM V. 28, the scribe explains that O and Omega are pronounced "in the same way". (Assuming he is referring to tone, not delivery). I took the Greek letters from Preisendanz transcript of the papyri, and threw them into an isopsephy (Greek gematria) calculator. actually adds up to 15,446 - weird... or did I miss something? Then I stumbled over the solution by coincidence in Kieren Barry's "Greek Qabalah" (4) when I wanted to double check if I had the correct isopsephy values. A magical formula apparently known as "The Great Name" which gematrically adds up to 9,999! And it was there all the time! and how many names does that add up to? SIX!!! BINGO! On the upper edge an annotation; First a series of vowels, then: These are (in total) 49 letters; the sum of the calculation is 9999. No mention of a scarab here. According to the authors, it's the series of 49 vowels that are supposed to add up to 9,999. What we have so far are these 39 vowels that add up to 8,291, as described above. I spent over an hour trying to "Jurassic-Park-Frog-DNA" (verb coined by Gordon White) the missing 10 vowels into the ones we already have - and I failed! It was just impossible to create an isopsephy value of 1,708 with just 10 vowels and possible values of 1, 5, 8, 10, 70, 400, 800 without deleting any of the letters that we already have. Aaarrgh! After a while of Frog-DNA'ing I got it! We can add 1 Ômega, 1 Ypsilon, 1 Omicron, 3 Iotas, 1 Epsilon, and 3 Alphas to get from 39 letters to the required 49 and reach an isopsephy sum of 9,999! hypothetically fit them into the missing papyrus piece. Have a play yourself! In case you end up with a better vowel combination, feel free to share it! To conclude: unfortunately the "London Papyrus 46" with the annotation is torn on the edge, so we will never know what its full content was but the reference to the scarab papyrus seems to make some sense. In my opinion it makes more sense than simply using the classic "AÔTH ABAÔTH BASYM ISAK SABAÔTH IAÔ" formula. I guess the only solution to the missing formula is the magic solution: take it, experiment, and see where it will take you. (3) Betz, ed. by Hans Dieter (1992). "The Greek magical papyri in translation including the Demotic spells" (2nd ed.). Chicago: Univ. of Chicago Press.